For its towering cliffs, spectacular waterfalls, granite domes and spires, glacially polished rock, and groves of Big Trees, Yosemite is world famous. Nowhere else are all these exceptional features so well displayed and so easily accessible. Artists, writers, tourists, and geologists have flocked to Yosemite—and marveled. Although there are other valleys with similarities to Yosemite, there is but one Yosemite Valley, the “Incomparable Valley” of John Muir. Appreciation of Yosemite Valley came early, and in 1864, less than 15 years after the general public became aware of the area’s existence, President Abraham Lincoln signed a bill that granted Yosemite Valley—“the ‘Cleft’ or ‘Gorge’ in the granite peak of the Sierra Nevada”—to the State of California. 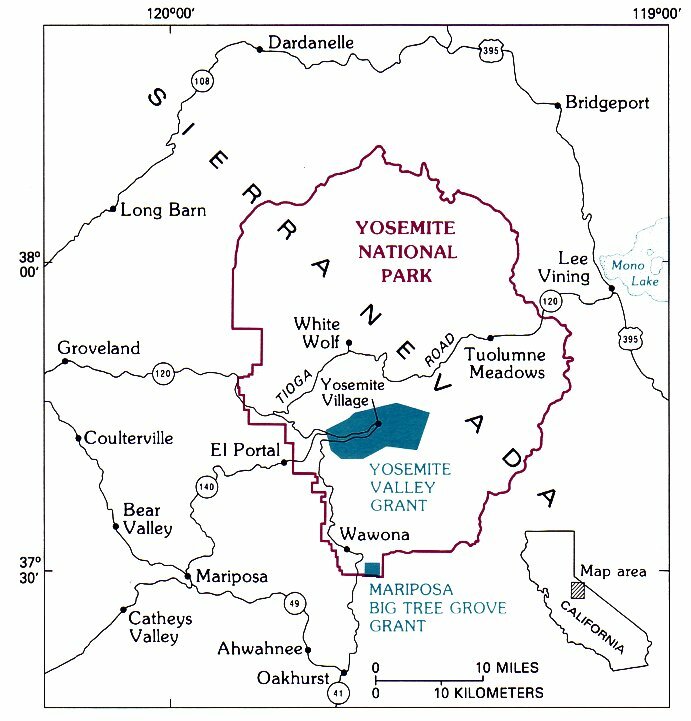 The act stipulated that “the premises shall be held for public use, resort, and recreation; shall be inalienable for all time.” Also included in the grant was the “Mariposa Big Tree Grove.” Though not the first official national park, Yosemite established the national-park concept and eventually evolved into a national park itself. An area larger than the present park, surrounding but not including Yosemite Valley, was set aside as a national park in 1890. 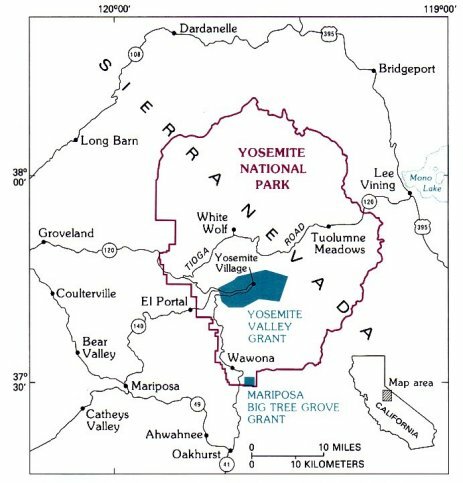 In 1906, the boundaries were adjusted, and Yosemite Valley and the Mariposa Grove were re-ceded to the Federal Government by California to create a unified national park (fig. 1). States, outside of Alaska. The central Sierra with its steep east escarpment is particularly awesome. Nevertheless, in 1833, Joseph Walker led a party up the east escarpment and westward across the range through Yosemite country. His route traversed the upland between the Tuolumne and Merced Rivers, a route later followed by the western part of the Tioga Road. Walker and his men were probably the first of European descent to view Yosemite Valley and the Big Trees, now known as giant sequoias. Yosemite Valley and the giant sequoias remained unknown to the world at large for nearly another 20 years after the Walker party’s discovery, until Maj. James Savage and the Mariposa Battalion of militia entered the valley in pursuit of Indians in 1851. Overwhelmed by the majesty of the valley, one member of the battalion, Dr. Lafayette Bunnell, remarked that it needed an appropriate name. He suggested Yo-sem-i-ty, the name of the Indian tribe that inhabited it, and also the Indian word for grizzly bear. [Editor’s note: For the correct origin of the word Yosemite see “Origin of the Word Yosemite.”—dea.] A year later, giant sequoias were discovered anew in the Mariposa Grove and in the Calaveras Grove north of Yosemite. The history of further exploration of the Yosemite area, and of the creation of the park itself, were well described by Carl P. Russell (1957). Of particular geologic interest was the excursion of the Geological Survey of California to Yosemite in 1863. After visiting Yosemite Valley, Josiah Whitney, the Director of the Survey, accompanied by William Brewer and Charles Hoffmann, explored the headwaters of the Tuolumne River and named Mounts Dana, Lyell, and Maclure for famous geologists and Mount Hoffmann for one of their own party. 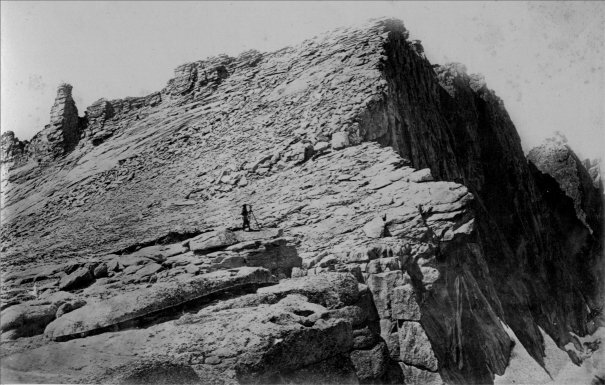 In 1867, another party from the Geological Survey of California again ascended Mount Hoffmann, accompanied by photographer W. Harris, who documented the scene with Hoffmann himself at the transit (fig. 3). Observations from these excursions, and additional topographic mapping by Geological Survey of California colleagues Clarence King and James Gardiner, provided the first description of Yosemite Valley and the High Sierra that not only contained reasonably accurate topographic information but also was relatively tree from the romantic exaggeration characteristic of the times. The term “High Sierra,” coined by Whitney to include the higher region of the Sierra Nevada, much of it above timberline, has been used by writers and hikers ever since. 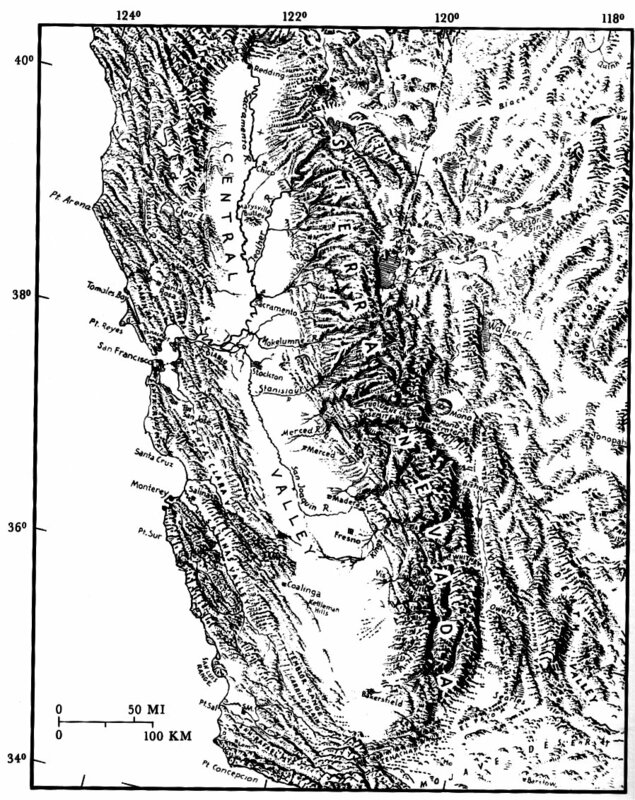 Whitney and his party recognized abundant evidence for past glaciation in the High Sierra but failed to recognize the degree to which glaciers had modified the topography, and Whitney ascribed the origin of Yosemite Valley to a “grand cataclysm” in which the bottom simply dropped down. Indeed, most geologic processes were poorly understood in Whitney’s day, and so numerous conflicting interpretations soon developed regarding the origin of many of Yosemite’s scenic features. The controversy that arose between Josiah Whitney and John Muir regarding the origin of Yosemite Valley reflects this situation. Muir’s observations in the Yosemite Sierra led him to propose that Yosemite Valley was entirely carved by a glacier. However, he overestimated both the work of glaciers and the extent of glaciation, because he believed that ice once completely covered the Sierra to the Central Valley and beyond. Thus, Whitney and Muir held opposing views that were both too extreme, although Muir’s ultimately proved more durable. Finally, partly in response to this controversy, a study of the geology of the Yosemite area was initiated in 1913 by the U.S. Geological Survey, with François E. Matthes studying the geomorphology and glacial geology and Frank C. Calkins the bedrock geology. Matthes’ conclusions, particularly with respect to the relative roles of rivers and glaciers in sculpting the landscape, have held up well, and his lucid descriptions and interpretations have enlightened many a park visitor. In the 50-odd years since Matthes and Calkins completed their studies, we have gained considerably more geologic knowledge of the Sierra Nevada; we have abandoned some of their ideas, but we still build on their pioneering efforts.